NASA delayed its Friday launch of a moon research mission because of weather issues and will retry on Saturday. The mission will provide new information about how the moon formed and will allow students to take their own pictures of its surface, panelists announced at a news conference at NASA headquarters in Washington on Thursday. The two spacecraft will be launched in the same housing, which will separate. They will enter synchronized orbits in January, principal investigator Maria Zuber said. The slow trip saves energy. Once in orbit, their speeds will increase when they pass over formations on the moon's surface, allowing scientists to measure those formations based on the distance between the two spacecraft. The project aims to study how the moon formed, its interior composition and why the side seen from Earth looks so different from the "far side," which isn't as dark because of lava flows, Zuber said. "Clearly we don't understand what is happening inside the moon," she said. The Grey's are letting us go back to the moon? Really? With what did the planet collide? Humans have differences. Differences in areas of interest and study. So thus science has so many areas of different studies. You can guess why then we fund various projects. So don't be a freakin idiot and post garbage of where you think money should be spent. We can not all be satisfied to study the air or just the water. Put your ignorant rants away you morons. To the religious wads – why the hell are you reading our science blogs? Go the hell away. Just like how you bi t-ch about your trashy sunday spews on your belief blog. Moon looks like a dancer. Not only can we enjoy the postures from its appearances, but we can also enjoy the experiences from its popular moments. Well, that's great Moon is coming to have twin dancing partner soon. Godspeed to NASA moon mission! I'll bet it has something to do with the Alien base under the lunar surface. This doesn't sound like a nation under God. Why not just remove that from the currency. Why can't science be conducted without religious persuasions. Why do you have to be such a whiner? How's this whining? Have you ever disagreed with things when they're not right? Or are you as complacent as they come? as for those opposed to this mission, and nasa in general, crawl back in your hole, or bury your heads in the sand for another couple yrs. nasa, the moon missions, and any exploration of space is extremely important for the long term survival of our species and the planet as a whole. god is obvously not making any more land for us, most natural resources are being used faster than they can be renewed and humans are not going to curb our need/use of them either. the only hope we have is to explore options elsewear. current technology does limit us, but as we've proven over the last century, it wont limit us for long. when we have a need, we find away to satisfy it. we have found inumerable valuable resources on the moon, even with our limited ability to investigate (helium3) we know there are more to find with a minimal amount of work. we have discovered extra solar planets, some appear to be 'earth like', and while yes they r currently out of physical reach, technologies are advancing at a rate that will give us a chance to reach them. our future i dependant on better understanding our selves, our planet and the system/s we are a part of. our destiny lies in space or the dirt. if we dont reach out, we will be history. I dont care, I'll be long gone by then. Who cares about what happens when I'm gone anyway? LOL! You sound just like the folks at the Tower of Babel prior to God scattering them and confusing the languages. They too wanted to make a name for humanity. Perhaps your usage of 'god' was an impersonal god and not God. Your story is inaccurate. The GRAIL mission was scrubbed on Thursday due to high-level winds which were slightly outside the constraints limit. 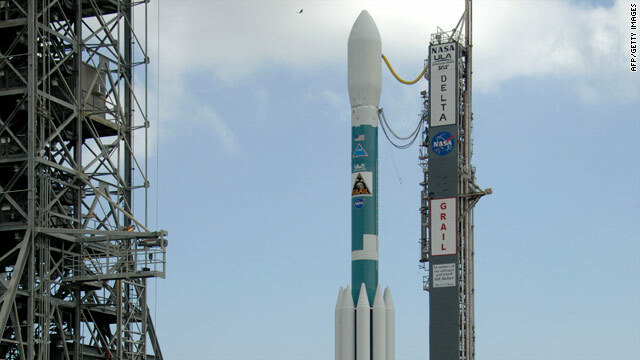 However, the launch attempts for Friday were called off due to concerns about data acquired from the Delta II's propulsion system during detanking operations after the scrub. The delay from Friday until Saturday has nothing to due with weather conditions. Please research your stories better in the future and get your facts straight. Everyone knows tht the moon is made of green cheese. WOW you dont know how much i hate you for being so randomly stupid and just plain retarded. A wise man (Constantin Tsiolkovsky) once said, "Earth is the cradle of Mankind; but one cannot remain in the cradle forever". Enough said. When was this mission conceived? When we found water and Helium3? To Ted and all the other idiots complaining about this being a waste of money, have you ever heard of rare earths? Because that is exactly what is thought to comprise alot of the moons mass. One in particular that a professor has found a way to utilize in nuclear fusion that will only project 1 percent nuclear waste. Thats a damn good reason to further evaluate the moons inner composition. science is stupid, give me the money instead and i'll put it to good use! Mining the Moon is currently forbidden under International Law. It will most likely never occur for Earth-based uses. If we were to colonize the moon, though, then I could see the benefit of looking for and mining rare earth minerals. why dont we spend money on pointless wars instead? Since they do not reply to their email...I have to suspect this is just a scam. When there is no true and useful goal, comes the following sentence:"The mission, called GRAIL, will study how the moon was formed. It will explore "the structure of the lunar interior, from crust to core... to advance understanding of the thermal evolution of the moon," NASA said. ", or something similar, such as learning about the formation of the solar system, universe, etc. I am sorry, but I think these type of missions are mere excuses to do "something". After the spectacular success of the lunar landing, sending satellites around some of the planets, we learned one thing: unfortunately there is nothing else out there (within our solar system) which would be true and useful interest to us, as in mankind. Nothing. Even if humans could travel to any of the other planets which is impossible with our current technology. We still dream big (based on the Moon landing success) and do small. The rest are "fillers" to maintain the "system". And i have one element to inform you about....Helium 3....abondant on the moon and with enough clean energy to replace all our energy needs for thousands of years. Not to mensions much easier to refuel sattelites in GEO or LEO orbit if mined and launched from the moon....these are plans currently underway. If the moon has this much to offer, imagine what Titan, Europa and the over 160 moons in the solar system, some of which could very likely have life! Just want to make sure people understand that mankinds interest are anything but limited to the Earth, eventually, if we want to survive as a race, we will have to one day leave our home and find a new world to inhabit. I enjoyed your comments more than the original article. The information you provided is so much more interesting than 'Clearly we don't understand what is happening inside the moon'. Apparently there are more useful projects to advance. So please tell me, how can we stay on track and advance your projects, if NASA does not share/inform us of them? You're completely, 100% wrong. We barely know the depths of our own oceans, let alone the rest of our explorable solar system. And while the final missions do provide us with useful scientific data, a big part of NASA's sucess is the road, not the destination. The space program and the military are the two areas our government actually pushes innovation and development in ways the private sector doesn't have the will or resources to affect. Designed the solar arrays for these birds.....greatest little program there is...much love to the JPL and LMSSC teams that put this thing together. Go team GRAIL! This is a moon mission. But, the idea of using solar panels instead of RTG's on a Jupiter mission is...insane. Funny you mention that....although I was not the lead panel design engineer for JUNO, I was heavily involved in the solar panel development. Juno is the first real LILT (low intensity low temperature) program for the space solar power world. We really had to come up with new testing requirements and a new spec for the solar cells, and follow up with a HUGE arrays to get the power we needed at 5.5 AU. But given the success, ill tell you this...it wont be the last LILT porgram! Congrats KR! Great job, this must be so incredibly satisfying! Best wishes to you and your team. Too bad some folks on this forum have no appreciation for your team's accomplishments. "little" program? Why belittle it so much? prsfan2010, not little in terms of science, but in terms of budget and size. These are VERY small spacecraft build under a very tight budget, but by far with one the best designs and teams i have been involved with to date! Were we to lose that "dead piece of rock", the Earth would no longer be habitable, Ted. Its much more important to us than you apparently know. NASA's entire budget is 0.6% of the Federal Budget. They give us the biggest 'bang per buck' ratio of any government agency. Losing the moon wouldn't make the Earth uninhabitable – that's a myth. However, a number of things would change, and most not for the better. If you knew anything about physics/astrophysics, you wouldn't be making idiotic comments like "that's a myth". A Myth? Where do you get your stuff from – neverland!? What makes the oceans move around, high & low tides, replenishing them with oxygen making marine life possible.The weather is affected by the temperature of the oceans, The temperature affects the Low & High pressure and thus the direction of the winds. The rain we get on land depends on this precisely balanced system. The list goes on if you include the effects on the atmosphere and the ozone layer and the magnetic field. No Moon would make our oceans practically static, causing unlivable weather changes. Basically a planet the would eventually resemble something like Mars. It could show insight into the formation of our own planet and our origins. It is a good stepping stone for future space exploration missions and other scientific ventures. The prospect of unfound resources. Our ancestors have been captivated by it for millenia. A bit over-ambitious would't you say? Our origins? We probably would need to probe the core of the last planet in the universe to have a conclusive answer. In the meantime let's secure resources outside of our planet for such a crusade. We are over the top with resources here on Earth and hopefully we are generously putting them to good use here. Seems like a never ending story. Le't's forget about finding our origins in space. We are here. And our earth core is so much closer. Now if we're just curious and thirsty for knowledge, then I'm just as curious as the next cat. ...as if science and education is a waste of money. Oh! You must be Republican.